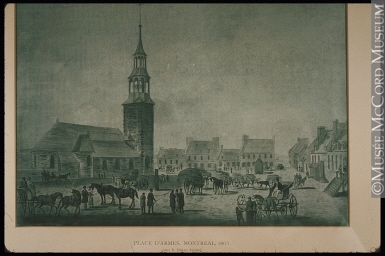 Place d’Armes, Montreal, 1807. Copyright McCord Museum. When I was doing research for Napoleon in America, I came across the following paragraph in the first volume of John Lambert’s Travels Through Canada and the United States of North America in the Years 1806, 1807 & 1808. I thought this was an interesting anecdote and wondered if, in fact, it had happened. Lambert was an Englishman visiting Lower Canada with his uncle. Though his volumes are generally considered realistic accounts of what he encountered, a number of the events described therein were not witnessed by Lambert directly, but told to him by people he spoke with in his travels. As Lambert did not reach Montreal until November 1807, that turned out to be case with this. I wanted to turn Lambert’s anecdote into a story and, as with all of my stories, I wanted to base as much as possible on what I could find of the historical facts. Robert Sym is listed in the Bibliothèque et Archives nationales du Québec’s online database of “Inventory after death in the Montreal region, 1791-1840.” His profession is given as “surgeon (chirurgien)”; date: 1807-09-17; place: Montreal; notary: Jonathan Abraham Gray. Robert Syms in listed in the database of Quebec burials for 1807, at St. Gabriel Street Presbyterian Church in Montreal. As you can see, there is discrepancy in the spelling of the doctor’s last name. I decided to go with Sym, based on the Gazette notice and the doctor’s listing in the 1807 Quebec Almanac, where he appears in the “Hospital Staff” section of a “List of His Majesty’s Forces Serving in Upper and Lower Canada” (as Robt. Sym, p. 80) and as one of the “Commissioners for the execution of an Act of the 40th Geo. III for the relief of Insane Persons and for the support of Foundlings: Montreal” (as Robert Sym, p. 20). There is also a list of “Surgeons appointed to examine those who request licenses, for the district of Montreal,” which includes a Richard Symes, who may or may not be the same person. The next thing was to determine who the other characters were. We don’t know which “Mr. McG” was “the intimate friend of Dr. Syms” referred to by Lambert. There were several in Montreal at the time, as Scotsmen were prominent local merchants and fur traders. I decided to make him James McGill (October 6, 1744 – December 19, 1813), a name familiar to Canadians as the founder of McGill University. McGill and Sym undoubtedly knew each other – they were both from Glasgow, they had both lived in Montreal for at least 30 years, and they both served on the commission for the relief of insane persons and the support of foundlings. It’s not unreasonable to assume a close friendship. McGill’s wife Charlotte Trottier Desrivières (née Guillimin). Then it was a matter of finding out as much as possible about the characters, the setting and the political climate of the time. Thanks to Lambert and other contemporary sources, I already had a good sense of the last two. I found corroboration of Dr. Sym’s deathbed conversion in É.-M. Faillon, Vie de Mlle. Mance et Histoire de l’Hôtel-Dieu de Villemarie, Vol. 2 (Montreal: Sisters of the Hotel Dieu, 1854). Robert Campbell’s A History of the Scotch Presbyterian Church, St. Gabriel Street, Montreal (Montreal: W. Drysdale & Co., 1887) was helpful, as were Stanley Brice Frost, James McGill of Montreal (Montreal & Kingston: McGill-Queen’s University Press, 1995) and (regarding Sister Céloron) Pierre-Georges Roy, La Famille d’Irumberry de Salaberry (Lévis, 1905). Given this background, the rest was simply imagining how the incident described by Lambert might have played out. John Lambert, Travels Through Canada and the United States of North America in the Years 1806, 1807 & 1808, Vol. 1, 2nd edition (London, 1814), pp. 337-338. The nuns stood out for some time, but were at length reluctantly obliged to part with their dear Doctor.